I can't believe this game has still not been reviewed! Two years have passed since I started the reviews section of sega8bit.com and yet this - one of the Master Systems most unique and challenging games has yet to be tackled by anyone! Shock, horror, I simply must do something about this! It's time to put things right by getting down and dirty with the Harrier here all by myself. Way back when I found out I was getting a Master System for christmas my dad showed me Astro Warrior and Shinobi as those were the games he had already purchased. He told me not to worry as he would try and get me a couple more. Not that I wasn't already over the moon with the games he had shown me, but since the Master System was such a costly item it made up a very large part of my Christmas present back then. One of the games I didn't see before I got to open it on Christmas day was Space Harrier. Apparently my dad had bought this from John Menzies, tried playing it and found out how difficult it was. Then decided that if it was so difficult for him it would be all but impossible for his Seven year old son. He took it back and swapped it for Afterburner. But upon trying Afterburner and deciding it wasn't very good and was equally as difficult he took it back yet again and got Space Harrier once again. Man I'm glad he did that. No offence to the great Afterburner game, but in my opinion it is nowhere near as good as Space Harrier. 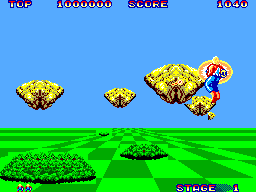 People always complain that the Master System version of Space Harrier is nowhere near as good as the arcade version. While this may be true, my first experience of Space Harrier was on the Master System, I didn't know of any arcade version and I sure wasn't disappointed with the Master System version. 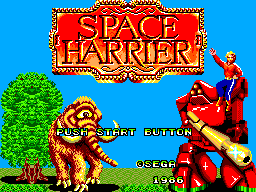 Anyway, enough of my nostalgic ramblings, Let's get into the meat of this game and I'll show you whats so good about Space Harrier. Space Harrier is a breed of game that isn't often seen nowadays. It's a forward scrolling shooter which you see from the rather strange perspective of behind the main character - the harrier. It's a style of game that has more in common with shooting games like Afterburner and Galaxy Force than any traditional character-based shooters. You play the role of the harrier who is trying to save the land of the dragons from a hostile invasion force. You must single handily blast your way through thousands of enemies. What I really like about Space Harrier is that it knows what people want. Awesome and strange enemies await you on each new level, each level has a distinctive looking boss to it and is inhabited by different enemies. Along the way you go through levels which are "speed levels" - in which you travel at insane speeds and often end up hitting a tower. You also go through bonus levels from time-to-time in which you get to ride a dragons back and try to run over trees.. err odd. But cool! The graphics in this game are simply awesome. At the time of release Sega proudly displayed on the box "Twice the Mega power". Presumably they assumed that when the public saw this they would recognise it as a superior title to those who only had "The Mega Cartridge" stamped on the box. Perhaps this was the reason why the cartridge was a bit more expensive than others at the time. Comparing the graphics of Space Harrier to other Mega Cartridges you can really see the benefits of all that extra memory. This game is graphically stunning. Nowadays when gamers see this game that did not play it back in the day the first thing they spot is the "jaggies" around each sprite and the "jerkiness" while it scrolls. Master System fans will be able to see beyond this however, and be able to recognise the achievement that Sega made by cramming this massive System 16 game onto a Two Mega cartridge. 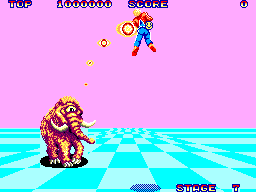 Space Harrier possibly has one of the most distinctive and instantly recognisable theme tunes in video gaming. This is one area of the game that is awesome. The tunes are always upbeat keep you focused on the game. Although my only complaint is that there is simply not enough of them! A few years back I was lucky enough to get hold of Sega AGES Vol 1 for the Sega Saturn and got the play the arcade perfect version of this game. I have to say that all the tunes from the Master System version were in there and were easily recognisable. Sega really did a great job in the music department again. Sound effects I find a little more difficult to rate. There really isn't a great variety of sound effects, but the ones present are total class. You can hear the harrier scream in pain if he dies and you also hear him shout "get ready!" when you resume play. All are done very well and at the time of release this was amazing. But now I find myself sitting getting tired of the lack of diversity in the shooting/explosion sounds. Controlling the harrier is made as simple as it possibly can be. You use the D-pad to control movement of the harrier. This responds nicely to your input. You can use either button to fire the harrier's laser. I would say that this is another game that you really need to go out and by a rapid fire unit for though, it gets really tiring having to press the fire button repeatedly. Also it would have been nice to see the second button used for something else, like maybe a special weapon. I've been playing this game for years now, and I still haven't beaten it. In fact, I don't even think I've got close to finishing it. The later levels are simply too difficult! I always get to around the same point and die. I keep trying every so often, but the frustration factor is high in this game. You'll come back to it, but possibly won't play it religiously until you finish it. Space Harrier is a real oldie but Goldie. If you are missing this from your SMS collection then you really have been playing the wrong games! Space Harrier is one of Sega's classic games that everyone should own in one form or the other. The Master System version although admittedly inferior to the Arcade version is still an awesome play.